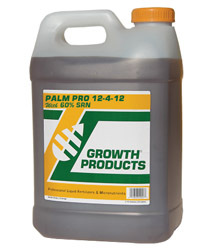 Newly introduced by Growth Products, Ltd., Palm ProTM 12-4-12 has 60% slow-release nitrogen plus Mg, Mn, Fe, Zn and humic acid. With its chelated micronutrients, low salt index, easy-to-use liquid formulation, and attractive price, Palm Pro is the perfect choice for all native and nonnative palms. Palms require plenty of nitrogen and potassium for good growth, but react poorly to too much phosphate. Palm Pro matches these needs by including slow-release nitrogen that allows for a 3- to 4-month nitrogen feed, the right amount of phosphate, and plenty of potash derived from high-quality, chloride-free potassium carbonate. Palm Pro includes 2% manganese to prevent or correct manganese deficiencies that cause yellowing of new leaves, and 3% magnesium to prevent or correct magnesium deficiencies that manifest on older palm leaves. It also contains chelated iron, copper, and zinc.The chelation of these nutrients in Palm Pro is a huge positive, since it allows the nutrients to bond to the soil and roots where they can be fully utilized by the plants. Palms are often grown in sandy soils, which naturally have excessive permeability, a low cation exchange capacity, and a low nutrient holding capacity. Thanks to its high organic content, Palm Pro excels in actually improving these soils and thus boosting overall palm health. Palm Pro contains 2% humic acid and 2% organic sugars, both of which can improve soil moisture retention, increase exchange capacity, and enhance soil fertility. Organic yucca extract serves as a natural wetting agent and an aid to nutrient uptake. Palm Pro can be used as a soil injection for landscape palms, in drip irrigation for nursery stock, for hand watering in interiorscapes, and as a foliar feed. Palm Pro can also be used in low water volume applications in urban areas. 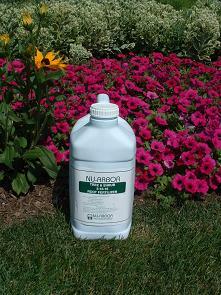 With the low volume water program, ½ gallon of Palm Pro liquid solution is mixed with 40 gallons of water. The low water volume program allows landscapers to treat a greater number of trees with less water, saving time and labor.